A giant black hole has been jerked around twice, causing its spin axis to point in a different direction from before. If confirmed, this discovery might explain several mysterious-looking objects found throughout the Universe. A new deep observation with Chandra of 4C +00.58 was key in making this finding. When combined with radio observations, the X-rays suggest collisions with other galaxies may be responsible for the changes in the black hole's spin. This image shows the effects of a giant black hole that has been flipped around twice, causing its spin axis to point in a different direction from before. 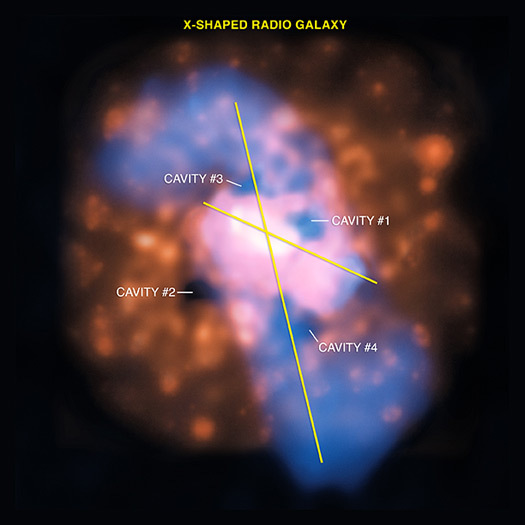 The large optical image, from the Sloan Digital Sky Survey, is centered on a radio galaxy named 4C +00.58. The smaller image to the right shows a close-up view of this galaxy in X-rays (in gold) from the Chandra X-ray Observatory, and radio waves (in blue) from the Very Large Array. At the center of 4C +00.58 is a supermassive black hole that is actively pulling in large quantities of gas. Gas swirling toward the black hole forms a disk around the black hole, generating strong electromagnetic forces that propel some of the gas away from the disk at high speed, producing radio jets. A radio image of this galaxy shows a bright pair of jets pointing from left to right and a fainter, more distant line of radio emission running approximately from the top to the bottom of the image. 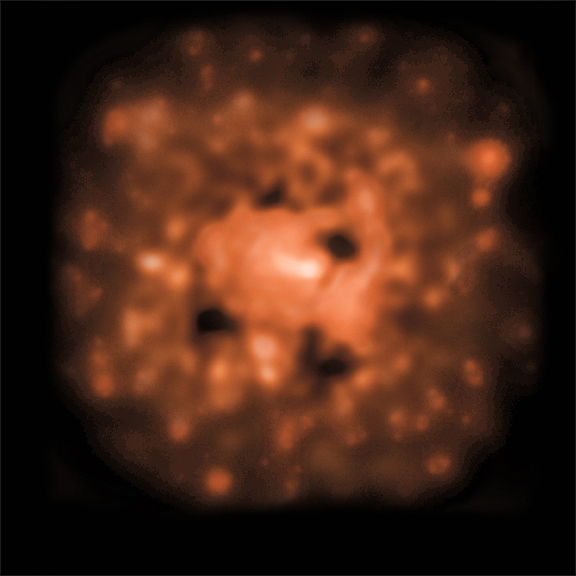 A labeled image shows these two sets of radio emission. This galaxy belongs to a class of "X-shaped" galaxies because of the outline of the radio emission. The X-ray image of hot gas in and around 4C +00.58 reveals four different cavities -- regions of lower than average X-ray emission -- around the black hole. These cavities come in pairs: one in the top-right and bottom-left (labeled cavities #1 and #2 respectively), and another in the top-left and bottom-right (labeled cavities #3 and #4 respectively). Special processing was applied to this image to make the cavities more obvious. According to the scenario presented by a new study, the spin axis of the black hole ran along a diagonal line from top-right to bottom-left. The galaxy then collided with a smaller galaxy. Possible evidence for this collision is seen in the optical image, in the form of a stellar shell. After this collision, a jet powered by the black hole ignited, blowing away gas to form cavities #1 and #2 in the hot gas. Since the gas falling onto the black hole was not aligned with the spin of the black hole, the spin axis of the black hole rapidly changed direction, and the jets then pointed in a roughly top-left to bottom-right direction, creating cavities #3 and #4 and radio emission in this direction. Then, either a merging of the two central black holes from the colliding galaxies, or more gas falling onto the black hole caused the spin axis to jerk around to its present direction in roughly a left to right direction. Coordinates (J2000) RA 16h 06m 12.70s | Dec +00° 00' 27.10"
My question is if we consider 4 different black holes for instance is it possible that these black holes are diagonally placed to each other? Is there any such discovery made? I have been reading about hyper-velocity stars - stars that for some reason are outside of their galaxy and traveling a very high velocities. My question is this, supposing that the star has a system of planets that have largely or entirely remained intact after being ejected from the galaxy - what advantage to a solar system is there in being within the gravitational bounds of a galaxy? Or can a solar system exist well enough outside a galaxy? I don't understand what is black hole, what harm will it do? when and why will it do? why supermassive black hole pulling in large quantities of gases? Thanks for your compliment and for your question. Science is giving us an increasingly sophisticated understanding of the evolution of our solar system and the Earth, and the development of life. The discovery of hundreds of planets outside our solar system and continued studies of the evolution of Sun-like stars is also providing important context. Ultimately we may find that Earth-like planets and life are common in our galaxy. This would suggest a pattern, rather than a design. Love your work. Your website provides some far out distraction during the work day. The photos and explanations are both clear and fascinating. Do you think earth's corner of the universe shows design or just random coincidences of factors friendly to advanced life. Thanks for your comment. I don't have any more information about that object, but it would be possible to use a tool like the World Wide Telescope to try to hunt down more information about it. Thanks for your interesting theory. The Earth's location near the plane of the Milky Way galaxy means that we are shielded from much of the radiation that might be generated by the central supermassive black hole. Even without this shielding it's very unlikely that Earth would be regularly hit by randomly oriented jets caused by large mergers. Supermassive means a mass of millions to billions times the mass of the Sun. By contrast, there are intermediate mass 100-1000 times the Solar mass, Solar mass black holes, 1-10 x the Solar mass, and mini, evaporating black holes, Earth mass or mountain-mass black holes. The black holes at the centers of active galaxies, or inactive galaxies, like the Milky Way, are found to be supermassive. Pix are great, especially like the explanations of what's going on. Nice to keep learning things. Thanks for your efforts. Nice, black holes are fascinating. Can the flipping of the milky ways spin axis explain earths variable 25 to 29 million year cycle of mass extinctions spiral arm stars like our sun would have less shielding by dust and gas between the center of the galaxy and our solar system until approximately 4 million years later? when they would assume definite spiral arm formations again? I am happy that you work very hard to save the world and inform us that everything happens in space. I would love to join NASA. I wish you be success all the time good luck. There is a Double Galaxy to the left and up a bit, in the wide field view. I wonder if it is active too. A galaxy harboring a giant black hole. About 780 million light years from Earth. 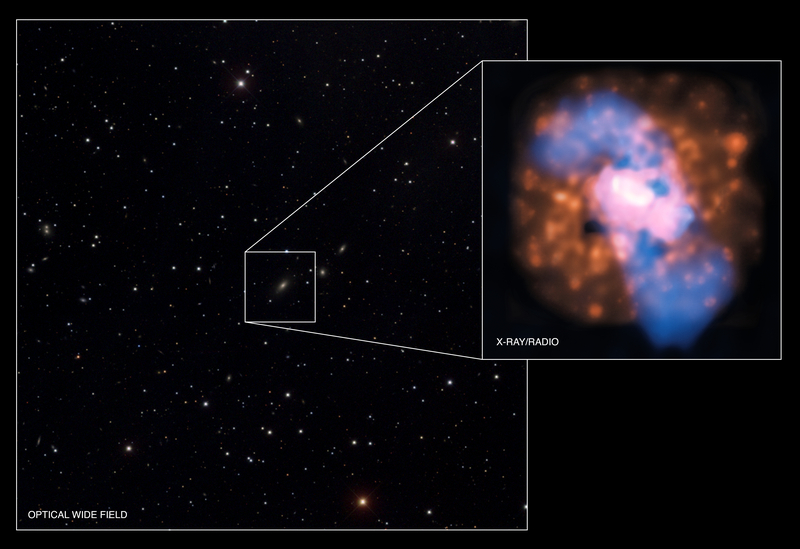 X-rays from Chandra were overlaid on radio data from the Very Large Array. The X-ray/radio pull out is 363,000 light years across. X-rays are gold and radio is in blue. In the constellation Serpens visible between latitudes 80 and -80 degrees.